My local Marks & Spencer finally unveiled their new beauty department. I hot footed it down there for a look and was pleasantly surprised to find some organic and free from brands. 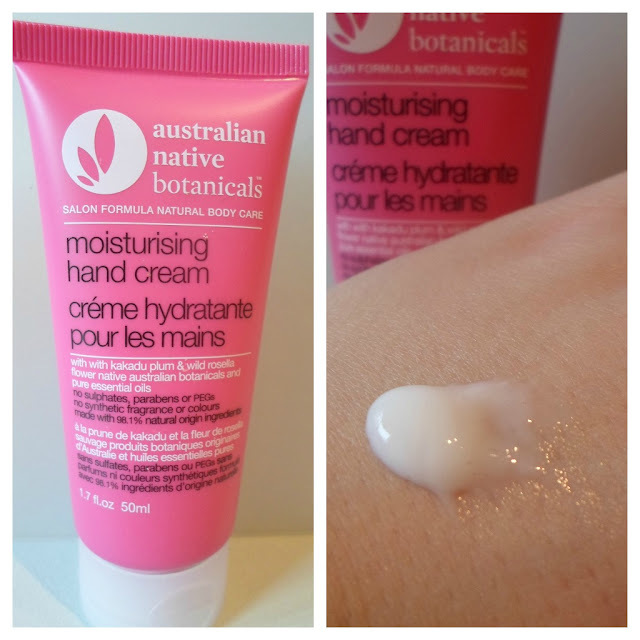 I picked up Australian Native Botanicals Moisturising hand cream. The blurb says 98.1% of the ingredients are of natural origin. It is free from sulphates, PEG’s, Parabens, phthalates, synthetic colours and fragrances. Also this is 100% vegan, no animal testing and no animal ingredients. I must point out it does contain Phenoxyethanol. The fragrance is floral and I assume comes from a combination of kakadu plum, wild rosella, geranium, jasmine and ylang ylang. The moisturising ingredients are sesame oil, jojoba, avocado, shea butter and cocoa seed butter. It is a lovely light cream, sinks in immediately and leaves my hands feeling soft. I do not notice a greasy residue so can type after applying. It is thumbs up from me, I like this cream and the results last. The 50ml size is affordable and perfect for throwing in your handbag. Aside from hand cream the range extends to shampoo, conditioner, body lotion and shower gel. But I really would like the brands to list all the ingredients on their website. Yes I agree it's annoying I must admit I was a bit lazy & didn't list them here as I would have to type them out.